Real-world problems can’t always be examined in a laboratory – that is why we offer a wide array of field assessment, monitoring, and testing services in a number of industry sectors. Our engineers and technicians are highly experienced in conducting field services in a variety of extreme and challenging site conditions around the world. By using the most advanced field assessment and testing methods, we are able to effectively determine the operating conditions of equipment and structures. We use this information to diagnose problems, evaluate operating performance, determine compliance, and recommend improvements. 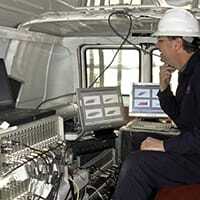 In the field, our engineers and technicians use the most advanced data acquisition systems and installation techniques to accurately monitor and collect data related to a variety of equipment, components, devices, and processes. We also provide a wide range of remote monitoring and measurement solutions including cellular phone / satellite monitoring and real-time posting of data on a secured website, for those who need reliable equipment monitoring data to be accessible from anywhere and at anytime.